Now if I am to quiz you about the daily commodities essential for offering Salah, chances are you’ll end up starting with the Prayer rug itself which is better known as Jaenamaz. Now, we all know that the basic purpose of a prayer rug is to provide a clean foothold for prayer as mandated. So it’s an obvious spot-on in any Muslim house-hold. 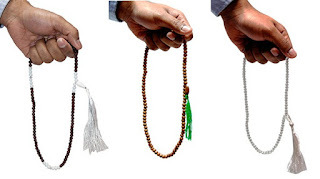 The next one on the check list is prayer beads. We all get confused counting on fingers don’t we? We have quite a collection on that one too. So we thought of compiling a collection from our end to meet the needs used in prayer. Hold your horses for the ideal clothes for namaz or the Muslim thobes comes in later. Starting off, we have a Hot Pink & Silver, JaeNamez Prayer Rug ideally suitable for young maidens who’d love to imbibe a bit of their girl –quotient even on the rug. A handi-work of spirals and silver makes it sassy and sweet! We’ve had many young takers for this one as well as mothers taking this as a stepping –stone for their young daughters to help establish prayers. Next we have another version in Brown & Silver, JaeNamez Prayer Rugs with traditional art in the centre. The third one, a Pink JaeNamaz is again a favorite with girls and mothers. The soft pink manages to capture the attention at the right place. Endowed with rich art-work, the silver play on the rug makes it a must –have. Finally we have some fresh greens in this green JaeNamaz with geometrical patterns. The interplay of silver with varied colors is an interesting mix. The Maroon Base JaeNamaz too works wonder in its feel and look. We have a variety in prayer beads too. Some are color coded like the one we have in Purple and White, Tasbeeh while others are a simple rendition of the traditional pearly green bead in colors light green. You have other eclectic colors in aqua blue, basic black and light yellow too. Yes we also feature the famous Wood-Brown Tasbeeh as well as transparent Clear Tasbeeh. I think it’s time for some Ibadaah, what say?